For math lovers -- or accountants for that matter -- an entertaining piece on Wired about Emil Dudek, "a technology enthusiast in South Wales, U.K., who has spent the last eight years acquiring calculators made in the 1970s, taking them apart, photographing them, analyzing the technology and posting it all to his website along with specs and comments on each machine." 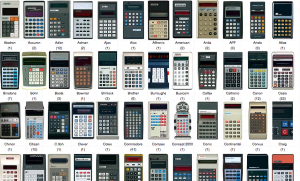 He's collected 583 calculators so far. Now that's dedication.